Antimicrobial resistance (AMR) is the ability of microbial pathogens to withstand attack by antimicrobial medicines. It has now been escalated by major world health organizations to one of the top health challenges facing the 21st century. AMR threatens the effective prevention and treatment of an ever-increasing range of infections caused by bacteria. It has reached alarming levels in many parts of the world and in some settings, few of the available treatment options remain effective for common infections. For example, the gastrointestinal tracts of farm animals are frequently colonized by antibiotic-resistant bacteria that can cause foodborne illness in humans. Substantial evidence demonstrates elevated antibiotic resistance in bacteria associated with animals fed with antibiotics and their food products. Multi-drug-resistant (MDR) Salmonella strains that are resistant to a wide range of antimicrobials have been widely detected worldwide, including the Arabian Gulf Countries, and are now becoming a serious cause of public health concern. To address these challenges, we aim to discover and engineer novel antimicrobial strategies against Salmonella pathogens. Specifically, we will design conjugative plasmids and/or phagemids to deliver antimicrobial synthetic gene cassettes expressing sequence-specific nucleases into Salmonella. These targeted antimicrobials will kill Salmonella based on their genetic signatures and thus put selective pressure against undesirable genes, such as antibiotic-resistance and virulence loci. Our engineered antimicrobial agents will be complemented with novel probiotics isolated from camel milk that exhibit effective antimicrobial activity against Salmonella. 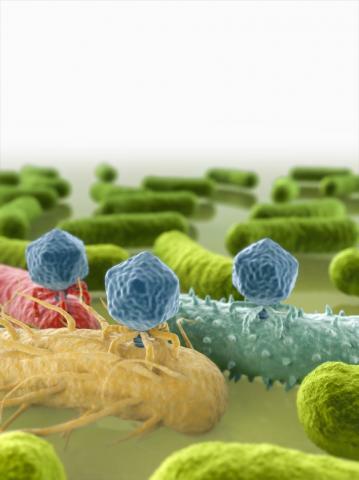 Furthermore, the ability of our sequence-specific antimicrobial agents and probiotics to act synergistically against Salmonella will be examined. Thus, the overaching goal of this proposal is to develop new technologies to reduce the prevalence of undesired antibiotic-resistance genes, to substitute novel technologies in place of chemical antibiotics as feed additives, and to prevent the development and reduce the prevalence of multidrug-resistant Salmonella in human and animals.